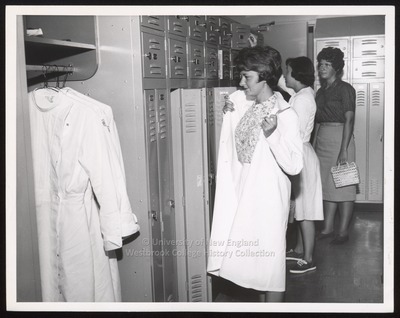 Three Westbrook Junior College students change into their dental hygienist uniforms in the DH Clinic locker room in this 1961 black and white photograph with L > R, Barbara Butman, Meredith Cronk and Rebecca Rice written in blue pencil on the back. Barbara Butman wears a long white lab coat over a white uniform skirt; Meredith Cronk and Rebecca Rice wear street clothes. Their uniforms hang from a near-by coat rack.